2.3 Why Should I Buy a Bread Machine? 2.4 Can We Recommend The Top Bread Machine Models? We’re Bread Machine Pros – experts on bread machines. On this site, you will find reviews to help you pick the best bread machine as well as other useful information about baking, cooking, and other kitchen products! We are the pioneers of in-depth bread maker reviews. At the time we started this site, there was virtually little to no information about bread machines online and we wanted to share our love for and knowledge of bread machines with the world. Bread machines are truly great! They’re one of those kitchen appliances that, when you know what they’re capable of, are a joy to have around the house. Why do we call ourselves pros? That’s because we have years of experience with them and have become quite familiar with them – which brands are reliable, what you should look for in a bread machine, what can you do with a bread machine other than bake bread, etc. If you’re looking to buy a new bread machine, you can browse our reviews to help you find the right model. For those who already own a machine, you might find our tutorials, how-to’s, comparisons, and other articles informative. We can guarantee that after you read everything on our website, you will become a Bread Machine Pro yourself! Unlike bread machines ten years ago, today’s machines have many settings. They don’t just make plain white bread. And they’re much more reliable. No need to break the bank when something needs fixing. Making bread at home was once a time-consuming chore without bread machines. Often times, the bread doesn’t turn out the way we want it to. With bread machines, you can have the aroma of bread fill your house and eat delicious, fresh bread every day. No need to mix the ingredients, knead the dough, wait for it to rise, and keep an eye on your bread while it bakes. The bread machine will do everything for you. What should you look for when purchasing a bread machine? While some of us may look for design, colour, or other individual preferences, we think there are some key features unique to this kitchen appliance that are important to consider. To get you to start thinking about these, we list some common features below that you’ll definitely be considering before making your purchase. Please also take some time to read our comprehensive Bread Machine Buying Guide to get familiarized with all the important features. Bread size. Bread machines commonly make 1-pound, 1.5-pound, 2-pound, 2.5-pound, and 3-pound loaves. Keep in mind that you should eat machine-baked bread within 2 days of baking, unlike store-bought bread which can be kept for a week. So you’ll only need to buy a bread maker that makes just enough bread to last you for 2 days. A 2-pound loaf should be enough for a family of 4. Bread shape. Do you want a traditional rectangular loaf of bread, or something round or square? Or perhaps you want your bread to stand vertically long instead of horizontally long? Bread machines make all sorts of bread shapes, so you can pick and choose the right shape for you. Bread pan. Most bread machines have a removable bread pan with either single or dual kneading blades. Removable bread pans are common in today’s machines, but you might find ones that aren’t removable. Make sure you choose one that’s removable because if it doesn’t come out, it will be hard to clean. When choosing a type of bread pan with your bread machine, remember that aluminum bread pans make a lighter and thinner crust than machines with thick cast aluminum pans, which make darker and thicker crusts. You should also look for a pan that has a nonstick coating because without it, your dough will stick to the pan and not knead properly. Best reviews. Needless to say, people have different opinions on each bread machine model. But it’s important to also consider consumer reviews because these people have used the machine before and they may point out important information about the machines. Read reviews and see what people say about the machines you’re considering. We also encourage you to use our comparison chart and read reviews on Bread Machine Pros – we’ve put a lot of time and effort into writing all this! Replacement parts. Unfortunately, you will likely need to replace the kneading blades, bread pan, or both of these things down the road. Both these parts will suffer wear and tear and it’s just one of those things where nothing can be done. So this is something to keep in mind when you purchase a bread machine. Kneading blades come cheap, but replacement bread pans can be expensive. They normally cost around 30% of what you would pay for your bread machine. So if you are looking to purchase a machine that costs around $100, then you can expect to purchase a replacement bread pan that would cost around $30. Best Affordable Bread Machine – Best for those with a tight budget. Best Bread Machine for Gluten Free Bread – Best for baking delicious gluten-free bread. Best Bread Machine Without Teflon – Does such a thing even exist? Best Horizontal Bread Machine – Top picks that make a horizontal loaf. Best Large Bread Machine – Great for large families. Best Small Bread Machine – Great for singles, couples, and small households. In this section we’d like to share some useful tips on using your bread machine and baking bread. Also, check out our How To Use A Bread Machine 10-step guide to learn how to operate a bread machine from start to finish. Follow the instructions. You’ll generally be adding liquids first before adding dry ingredients to your bread machine, but each bread machine operates a little differently. So it’s really important to follow the exact instructions in the manual that comes with your bread maker. Baking bread is like a science project. If you mix things in the wrong order, your bread won’t turn out great. Our tip: No matter what machine you use, make sure the yeast is separate from the liquid until your machine starts to mix everything together so that fermentation time isn’t thrown off. Before first use, clean it. Like any new product, there may be an odor or dust left behind from manufacturing or storage. When it comes to something you’ll ingest, you’ll want to clean it first before using. Before baking your first bread, run your bread machine for an hour with a cup of water and the lid open. This will help remove any smell and dirt left from manufacturing so that it doesn’t end up on your first loaf of bread. Make sure ingredients are at room temperature. Actually, some bread machines have a resting period at the beginning to allow the ingredients to come to room temperature before kneading. After you press “start”, the machine will just wait. However, some don’t. So you’ll want to prepare your ingredients ahead of time before starting your machine. Water, flour, eggs, and butter – make sure they’re all at room temperature. Remove kneading blade. For most bread machines, the kneading blade ends up getting stuck to the bottom of the baked bread since the bread bakes in the same area as it is kneaded. Some people may not like this because once you take it out, the bread has an unappealing hole at the bottom. Since most machines have a removable kneading blade, you can take it out once the kneading is done. Some machines even beep to let you know that the kneading cycle is finished for the exact purpose of taking the blade out, so you might want to look for this feature when buying a bread machine. Cool bread immediately. Although most bread machines have a “keep warm” function, we generally don’t recommend leaving it inside the machine if you don’t have to. This will change the texture of the bread. The optimal texture and colour is achieved once the bread is done baking. When your cycle is finished, try to be around to remove your bread from the machine and place it on a cooling rack to cool off. Don’t slice it immediately after baking because cooling it allows water molecules to escape, leaving the bread moist inside and not “spongy”. Clean pan by hand. It would be tempting to throw the removable baking pan into the dishwasher, but we recommend cleaning it by hand with a sponge and mild soap. You won’t want to damage with nonstick surface with anything abrasive because the next time you use it, your bread will end up sticking! Of course, most people buy bread machines to make bread. They may be tired of the taste of store-bought bread, they may want to control what ingredients they use in their breads, or they may want to save money (gluten-free products are expensive!). However, bread machines aren’t only for baking breads. Bread machines can also replace many appliances. Let’s say you want to make cake. Since most bread makers have a “cake” setting, you can use it to make cake from scratch. It replaces the stand mixer, hand mixer, and oven. And it does a really good job too. If you live in a small home and have always wanted to bake stuff but don’t have the space to buy all the different appliances, a bread machine is a really versatile tool to have. With bread machines, you can make many other awesome foods. We’ve mentioned dough and cake already, but most bread machines can make jam too. 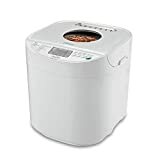 The bread machine we like most is the Panasonic SD-BMS105-SW, which can make really neat Japanese foods including mochi, udon, brioche, steamed bread, red bean bread, and “melon pan”. Can We Recommend The Top Bread Machine Models? Pros: Makes everything and makes it well! It has programs to make Japanese treats like udon and mochi. You can even make chocolate. The bread is spectacular – unlike anything you’ve tasted. It comes out like typical Japanese bread – light and fluffy. Plus, you can make special breads like marbled bread by adding your favorite coffee, green tea, or cocoa powder. Cons: No out of box English manual, since this machine is from Japan. It was not made for the North American market. You will need to scour the Internet for an English manual from one of Panasonic’s bread machines from other regions that have similar functions to this one, or find a way to understand the Japanese manual. Special note: Even though this product is from Japan, we didn’t purchase a voltage converter to use it, although other people have. This is because in North America, the voltage and frequency is 120V and 60Hz respectively. In Japan the voltage and frequency is 100V and 50Hz/60Hz. And the voltage and frequency on this bread maker is 100V and 50Hz/60Hz. When manufacturers make electronics, the industry standard is to design them to run above a particular voltage as a safety measure. So if something is designed to be used at 100V, by the time it goes through the hands of the engineer and the parts supplier, it would pick up at least an extra 20% margin of voltage, or 120V. So considering the proximity between Japanese and North American voltage and the way electronics are made, we didn’t feel we needed a converter. Similar to all electronics, though, we do recommend that you unplug it when not in use to avoid damaging power surges from lightning or power outages. If you are uncomfortable with not using a voltage converter, by all means buy one. Our opinion is that it’s overkill to get a voltage converter if you are going to use it in North America. If you are in Europe or somewhere where the voltage is 230V, you’ll need one that’s for sure. Different sport altogether! Finally, the Japanese plug fits North American plugs. Therefore you definitely don’t need an adapter. Special note #2: Panasonic Japan produces almost yearly updates of this bread machine. But the differences vary only slightly. We find that the biggest difference is the color. For instance before the SD-BMT1000 they had the SD-BMS105 which is pretty much the same thing but in white. And the model following the SD-BMT1000 is called the SD-BMT1001 which is brown. We like the SD-BMT1000 best because of the purple. But this line is starting to feel a lot like iPhone devices where the only thing that seems to change is the size of the screen. Anyway, you don’t need the newest model. Bread machines don’t need “upgrading” and significant changes, if any, come every 5-10 years. So we don’t recommend purchasing a new one every year/frequently. They are an investment. Use them until they break. Cons: It doesn’t have a fruit and nut dispenser, so you have to listen to the signal to add those. Also, there is no yeast dispenser, so make sure you add your ingredients in the order as instructed to get the perfect bread. Pros: Makes four different loaf sizes. Good for small and large families. It has a modern design, a nice screen, and a viewing window with a light. The automatic fruit and nut dispenser is a handy tool to have so you don’t have to wait around for a signal to add these ingredients. Cons: Because of the material of the body, the machine may dent. So please be careful if you’re going to carry/move it around. It doesn’t do anything to the quality of the bread. But aesthetically, dents are kind of annoying to look at. Pros: A great choice for singles, couples and small families. This bread machine has plenty of pre-programmed and customizable settings where you can set your own knead, rise, and bake times. It also has an auto-add dispenser for dried fruit, nuts, and seeds. Cons: It only has two crust settings – medium and dark – so if you enjoy “light” crusts, this could be a problem for you. Pros: Has dual paddles and handles gluten-free recipes well. Basically, it’s very similar to the BB-PAC20 but it doesn’t have the lid heater. It does come in white or black and sometimes you can pick it up for significantly cheaper than the BB-PAC20 though. Cons: Like the BB-PAC20 it doesn’t have a fruit and nut or yeast dispenser. Pros: You can make 3 different loaf sizes. It is one of the few machines that make a 2.5 pound loaf, so it is ideal for larger families. The automatic yeast dispenser is a foolproof solution to accidentally activating the yeast at the wrong time. Cons: It’s not as heavy as the other machines. Heavy is a good thing because there’s lots of movement inside bread machines and you don’t want yours to walk off the counter. Pros: Price. You can get this bread machine for under $100. Bread quality is good especially considering the price you pay. Plus there is the option to make 3 different loaf sizes. Cons: Again, it is not as heavy as the other machines so this one can feel flimsy. It might even be a good idea to plug this into an outlet that enables you to put this on the ground. Pros: A very affordable unit. Possibly the cheapest bread machine on the market that makes great bread. It does a decent job with gluten-free bread too. You’ll definitely be saving lots of money using this bread maker versus buying bread from the store. Cons: It’s a no-frills product. Sometimes the bread can turn out lopsided, depending on how the machine is feeling that day. It’s definitely not as consistent as Zoji or Panasonic machines. If you live in Europe and are looking for a bread machine (aka machine à pain, macchina del pane or brotbackautomat) you probably won’t be able to find the ones we’ve mentioned above because they are made for the North American or Japanese market. However, you can still find some of the best bread makers right in Europe. You should be able to find these bread machines in most countries: France, Germany, Italy, Netherlands, Spain, etc. And sharing the same voltage they work right out of the box no matter where you live. If you live in the UK, though, you have to be a little more careful. Some of these bread machines have a different plug than the UK and you would have to buy an adapter to use them. Another thing to be careful about is the language. Machines generally have labels in English, but we noticed that a few bread machines have labels in other languages such as French. To make life easier, try to purchase your bread maker inside your own country of residence (including local vs. global online shops) or confirm that the bread machine you purchase is in a language that you can read. Pros: The best bread maker in Europe currently goes to the Panasonic SD-ZB2512KXE. This bread machine has 33 programs including one for gluten-free bread. It focuses particularly on baking sourdough treats, which could be a plus for some people. There are “Rustic Artisan”, “Rustic Sourdough” and “Rustic Scone” bake settings, as well as dough settings to combine sourdough to bake in the oven. It comes with accessories to bake sourdough bread too. You get 2 sourdough cups, a measuring spoon, and a sourdough starter spoon. The bread machine features both a yeast and fruit/nut dispenser to release these ingredients at the optimal time. The loaves are consistent and tasty, and the machine is not too noisy. Cons: Because the body is made out of metal it is more prone to denting than a plastic shell. And sometimes it gets hot from baking so you have to be careful when it’s on. Sometimes the kneading paddles are difficult to remove. Pros: This is a great machine for gluten-free baking. It comes with 3 gluten-free programs: gluten-free bread, sweet gluten-free bread, and gluten-free cake. There are a total of 20 pre-programmed settings. The booklet has 28 recipes that are simple, easy-to-understand, and varied. This bread maker is compact but makes a bread loaf as big as 1 kg. Cons: There aren’t many negative things to say about this bread maker. It’s a basic model but it will handle the job for most people. Perhaps the usability could be improved by having a yeast and fruit/nut dispenser as well as a window to see what’s happening inside the machine. Pros: This bread machine has a large viewing window and a delay timer programmable up to 15 hours (compared to 13 hours on most machines). But perhaps its most appealing feature is the ceramic baking pan. The pan is coated with a proprietary sol-gel, non-stick coating claiming to be made without PTFE. This coating is called Fusion. While most bread machine pans are PTFE-safe, it’s nice to see companies continually work on improving them and trying to make them even safer. You get large loaves with this machine so it would be ideal for larger families. Cons: As far as we know the labeling on this bread maker is in German. But the manual is written in most European languages including Czech, Dutch, French, Italian, Polish, Spanish and of course English. Also, there are only 16 pre-programmed modes. So it’s not a fancy machine but will cover the basics like basic bread, whole grain bread, jam, and dough. Pros: This bread machine is basically the UK model of the Panasonic SD-ZB2512KXE. The one difference is that it has 27 programs instead of 33. It doesn’t have dedicated programs for baking “rustic” and sourdough treats. But it does have a gluten-free program. This UK model has both a yeast and fruit/nut dispenser too. And just like the Panasonic SD-ZB2512KXE the loaves are consistent and delicious. Cons: The body is made out of metal so it is more prone to denting and tends to get hot when baking. Pros: For busy folks, this bread maker is able to bake a 2-pound loaf in under 50 minutes with its “fastbake” setting. It’s an inexpensive bread maker that bakes better bread the most stores. It is comparable to the Oster CKSTBRTW20 – a no-frills, simple to use bread machine. Cons: Consistency is its major fault. Occasionally the dough doesn’t cook properly. If you need something more reliable we recommend the Panasonic SD-ZB2502BXC. Which bread machine had the best warranty? I have been reading all comments everywhere on the Web about performance but also saw many complaints about machines stopping to work in less than two years… We plan to use ours every second day and never buy store breads again! I have had various bread machines over the last 20+ years and most of them have lasted for five years or more ( Kenmore and West bend). Usually the pans start leaking where the blades are attached and need to be replaced after three to four years. I make bread every day and sometimes twice a day. For the last five years I have just used the dough cycle and then form the bread to whatever shape I want and bake it in the oven. I do not like the shape of the bread or the blade holes in the bottom when it comes out of the machine, but they are great for kneading and keeping the temperature even for rising. Have a look at the bread maker from Home Hardware. The Kuadori stainless steel. It makes very good bread and it has a 3 year warrranty. I have one and |I am very pleased with it. I am trying to find a bread maker with a stainless steel pan – no Teflon. Is there one you can recommend? Many people asked the same, but we’re not aware of any. If you find one, come back to let us know! Have you reviewed any machines with ceramic coated pans. I know there are some around but would be interested in your opinion of them. I too am keen to avoid Teflon. No, we haven’t. But yes, we know a couple of them exist and are being sold in Europe and the UK. For a quality brand, go with Zoji or Panasonic. I just to try to find one..there is Beem 5-in-1 Multi-Back Topclass Bread Maker ( German company ) Pan is bio ceramic not teflon! unfortunately its 220V and sold only in EU. You can hoverer buy a voltage converter 600-800 W + and use in Canada. If I am no mistaken bio ceramic is the newest in non stick coatings which holds up to a higher temperature than the 500 degrees for the regular Teflon coatings. So be sure to compare the details involved with bio ceramic temperature maximum allowance before breakdown of bio ceramic surfacing. Also, what about vegan bread? I saw mentioned the use of eggs, which I don’t intend on using… is that a standard bread-machine ingredient…? Thanks again! We are regular breadmakers – daily for nearly 15 years. We started out with a hand-me-down machine that lasted about 8 years, but when it stopped baking no service centre would touch it. So we bought a new “branded” machine, and since then we’ve been so unimpressed. The tins scour out their teflon coating just from the seeds added to the mix, the paddle pins leak and fall out. We’ve had 3 machines in the last 9 years, and three replacement tins – one under warranty, two we paid stupid money for, almost as much as buying a new machine. We try to be environmentally responsible and face dumb choices like that 🙁 So here we are, machine #3 in a bad run, and the paddle pin has fallen out. This time we are really reluctant to spend $100 on a new tin when the machine cost us around $150 on sale. But the machine still works fine… so frustrating. 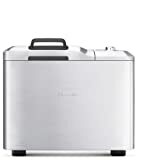 I’d really appreciate any feedback from users who know a brand of breadmaker where tins are affordable for replacement, or where the tins are actually made fit for purpose. I have a Mr. Breadman and have used it for almost 30 years….no scratches, leaks…nothing…just like new!! I have also had Breadman, and really liked them. The first lasted around ten years, used several times a week, sometimes every day. Lost the paddle & couldn’t find a replacement. Second one similar model, have had it 8 years, the pan sprung a leak. May be able to replace gasket. If I can, I’ll keep using it. If not, I will NOT buy another Breadman. From what other users tell me, the new ones are not durable at all, a high failure rate of both machine and pans. I’m here to see what my options are. Pricy, but I’m thinking Zojorushi. They last. Hello and thank you for offering this site. I can use suggestions regarding quick/sweet breads using a bread machine. Is that a wise decision? We “used up” a Hitachi HB-B101 after more than 15 years of regular use–2 loaves a week. It made a vertical loaf. We purchased an Oster that also made a vertical loaf and returned it after a couple of uses because the bread had very little flavor. Then we bought a Zojirushi BBCC-Z20 in 2009, (it makes a horizontal loaf), and we are not very happy with it. Please explain why using the same ingredients (same brands of flour, yeast, etc.) gives such different flavor results in different machines. I would really like to buy a homemade flavor additive to give plain white yeast bread some flavor. Even using the dough setting then baking the loaf in the regular oven didn’t really make a much of a difference. I don’t notice the lack of taste with whole wheat breads. It can make a huge difference in the way the ingredients are combined and kneaded. Temperature of the ingredients is also a huge factor. That’s why some bread machines (for example the Zoji BB-PAC20) wait until your ingredients reach the optimal temperature and also why not all bread machines are made equal. The Zoji BB-PAC20 consistently churns out perfect bread because it does these little, but important, things that most of us don’t notice. Some machines have a rise period that is too warm, which does not allow the flavor to develop. I learned to make bread by doing a sponge first. With the machine, I put the water and half the flour and 1/4 tsp yeast in, let it knead long enough to mix well, then turn the machine off. I let the sponge rise for several hours (or overnight if it is cool, sometimes even in the fridge) until the sponge is bubbly. Be careful not to let it go flat. Then I add the rest of the ingredients, but just half the amount of yeast, and set it for the “fast” yeast bread. The first rising brings out the flavor in the flour. You can also program a longer rise and use less yeast. The longer rising time allows the flavor to develop. I started using a machine mostly because I have a hand problem that makes kneading difficult. Now I love what a good machine lets me do with making various breads, and don’t mind fiddling with the programs or using timers to remind me to check on the dough. I have Panasonic SD YD250, and I like it a lot. There aren’t many bells and whistles, but it seems of solid build, and it consistently turns out good bread. The pan is heavy and thick, and my bread has stuck in it only once during the two years I’ve been using it. I grind my own wheat and make bread only from whole grain flour. I’ve been using gluten and like how it improves the volume. I also have been adding a pinch of diastase to sugar-free doughs, and I believe it actually helps to keep the yeast going during long slow ferments. I use live kefir as the liquid for the dough, and I like the flavor boost it imparts. My goal is to do long sponge/dough soaks that don’t overgrow/go flat, and this has been a challenge. Lately, I’ve been mixing the liquid ingredients with most of the flour, some gluten, and just a pinch of that strong SAF yeast which makes even my refrigerated doughs expand and collapse. I am able to get long soaks this way, by drastically diminishing the yeast, and when I scoop the whole thing into the bread pan on top of the remaining flour, salt, and shortening, I can then use the Basic or Whole Wheat cycle with the usual amount yeast dispensed from the Dispenser. The bread can actually come out quite good this way, and the Panasonic delivers consistent results. I am saying all this to show how a baker can get creative with his machine, in this case a Panasonic. Beware, though. Your measurements must be precise and your technique exact: the ratio of flour to liquid is rather critical to a perfect loaf, and you will have to experiment to find the proper amounts of each. Panasonic’s recipe guide is a good place to start, and its Manual tells you what you need to know. Bread making with a machine is more of a science than an art. I highly recommend a food scale. If you do your homework, become knowledegable about your ingredients, and keep good records, your Panasonic will reward you graciously. I don’t miss a window on top, I would like an automatic fruit and nut dispenser, and I would like a display that told me what cycle the program was in at any given moment. I’m looking for the smallest bread machine with a 2 lb capacity. I only use it for making/raising dough up to a couple of times per week so I don’t really care about the baking ability :). Do you have a recommendation for that? Thank You!